Vilario's Rest Map of location in Port Maje Region in Pillars of Eternity II: Deadfire Video Game. 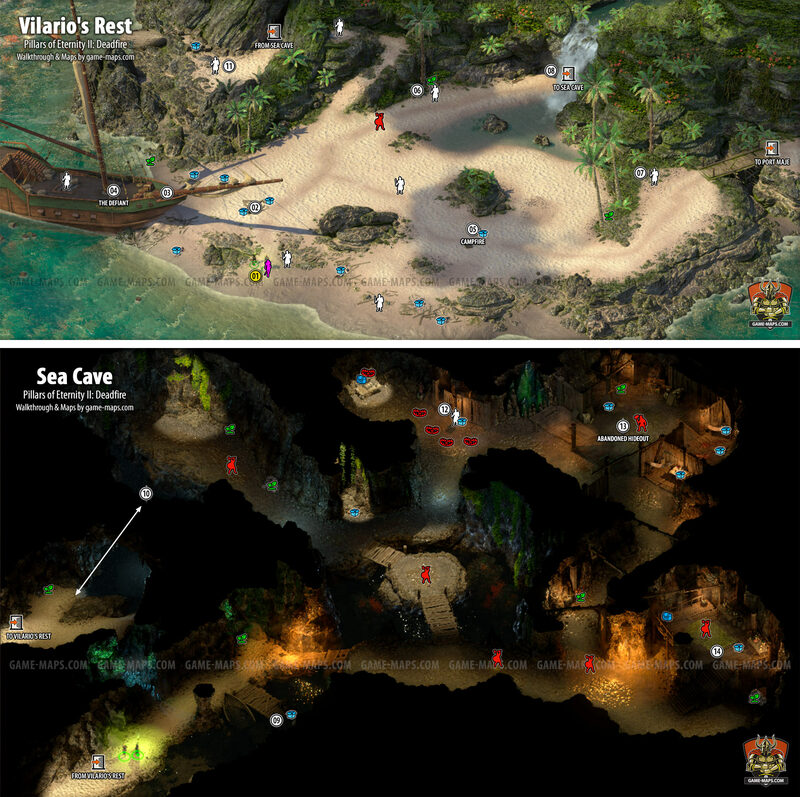 Sea Cave Map. NPC: Edér, Irrena, Chitupec, Eld Engrim, Beodul. Helping Hands Quest, To Hunt a God Quest, Stranded Quest. You come to Vilario's Rest after your ship The Defiant crashes on the shores of the island of Port Maje. Edér he is your first companion and party member. He is in you party now. If you are not Rogue it may be a good idea to choose Rogue specialization for Edér. The Steward the sculpture is nearby. The first thing you should do is find your crew dispersed around. My old crew's dead and gone. Maneuvering the ship may be more difficult on my own, but at least my company is improved. I didn't have the time to waste on finding my old crew. I left them on the island. I couldn't save all of my old crew, but at least I won't be managing the ship entirely on my own. We lost plenty of people in the wreck, but I managed to find a few of the old crew. From the beginning of the game, you also have two quests of main story line - The Hunt for Eothas. Seek out a means of repairing your ship. The ship isn't as pretty as it used to be, but it's seaworthy. I'm free to sail the Deadfire, and resume my pursuit of Eothas. Irrena save her, she is a member of your crew. The members of your crew that you saved will gather here. Chitupec will be here when you saved him at the very beginning of the game. Another crew member to save. Eld Engrim save him, he is crew member. Enter Sea Cave to seratch for missing crews. Swim to other part of the cave. Talk to ghost, you can earn Disposition: Benevolent here. Return to Campfire, take rest and eat some food you found. Purchase repair supplies, cannon shot, and medical supplies for your ship. I can find a vendor selling these items in any port town. Purchase supplies for your ship. I've stocked my ship with the supplies necessary for a voyage. I can find sailors seeking employment by speaking to tavernkeepers in any port town. Hire five crew members for your ship. I've recruited enough sailors to make running my ship reasonably efficient. Sail to Port Maje and buy supplies.